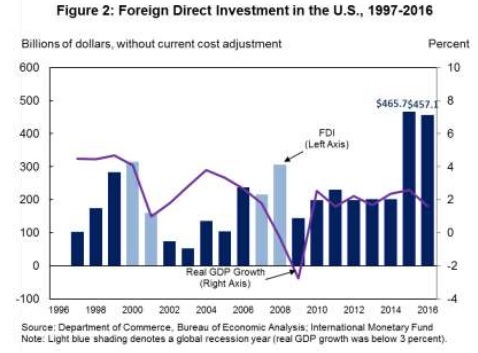 "FDI inflows on a historic cost basis in 2015 were the largest on record at $465.8 billion while 2016 inflows, though slightly lower at $457.1 billion, were at the second highest level on record. FDI in these two years was more than double the average annual inflows of roughly $200 billion for 2012-2014. Increased investment in manufacturing, specifically in chemical manufacturing, accounted for most of the investment gains for both 2015 and 2016. "The United States had an inward FDI stock of $3.3 trillion and $3.7 trillion, on a historical-cost basis, for 2015 and 2016 respectively. The United States’ FDI stock in 2015 ($5.6 trillion on a current-cost basis) was more than three times larger than that of the next largest destination country. Total inward stock in the United States grew at an average annual rate of 7.8 percent per year from 2009-2016." 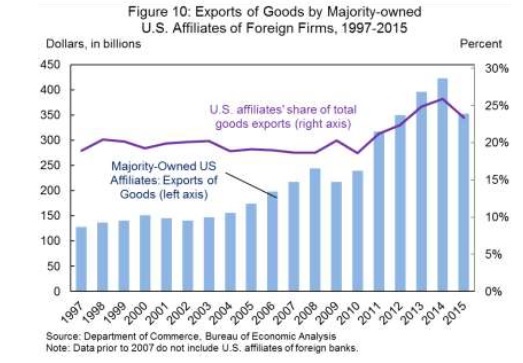 "Majority-owned U.S. affiliates of foreign entities exported $352.8 billion in goods, accounting for over 23 percent of total U.S. goods exports in 2015 (the most recent year for which this data is available). 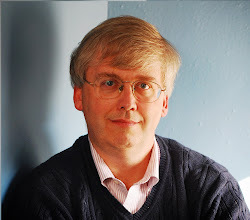 They are also a catalyst for research and development, spending $56.7 billion in 2015 on R&D and accounting for 15.8 percent of the U.S. total expenditure on R&D by businesses." Given that FDI emphasizes manufacturing, R&D, and exports, it's not a surprise that the jobs with US affiliates of foreign firms tend to pay well. "Majority-owned U.S. affiliates of foreign entities employed 6.8 million U.S. workers in 2015, up from 6.6 million in 2014, and provided compensation of nearly $80,000 per U.S. employee in 2015. That is higher than the U.S. average of $64,000 in the economy as a whole for the same year." Teacher Absenteeism in the U.S.